I love love love traveling, hosting parties and events, anything gold or glitter, throwing confetti, and champagne showers! Hah -basically making a mess! #sorrynotsorry There’s more “if you really knew me” here! or a friendly suggestion in my case. If you watch HGTV you know that bathrooms and kitchens sell homes so updating them is a must. Spending money updating your kitchen and bathroom will give you a serious return on your investment. You'll get it back. You have to spend money to make money. Did I drill that one home? Make up your mind how deep you want to go. Do you want new cabinets, a new sink, new faucet, custom built-ins, a new tub, new shower? List out everything you're going to redo and make a plan. Then decide if you're going to do it yourself of hire a professional. I'm not a DIYer so if you're like me, I highly recommend hiring a professional. Typically 2-3 price quotes are enough but take into account their costs on top of materials. There are so many hidden fees I never accounted for. For example, removal of existing countertops, sinks, and plumbing. The crew that paints or installs the vanities doesn't install countertops and the crew that installs the countertop doesn't do the plumbing. 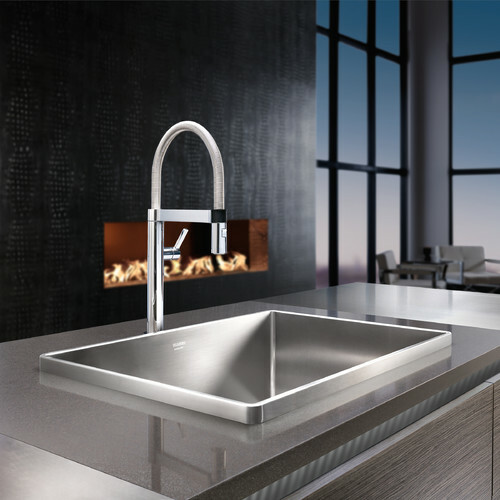 There are also things you should know like round or square sink and what type of edge you want on your countertop. Decisions decisions. 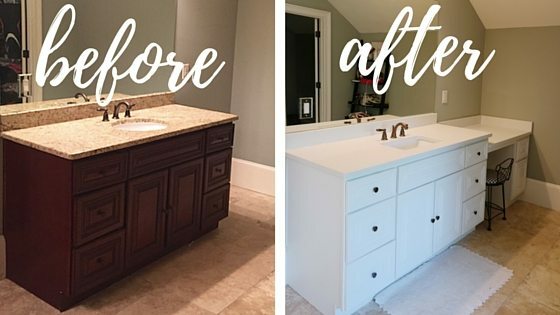 For me, I decided to just redo my bathroom vanities which included a fresh paint job (from brown to white), new countertops (from Caesarstone of course) and new sinks (square). I also had custom built-ins added; A makeup vanity on my side and a towel cabinet on his side. I hired Top Shop Stone to install my countertops and sinks and loved their work! If you're in the Atlanta area I'd recommend going with them! Now the fun stuff! I love love love the design aspect and choosing colors! If you guys don't know there are 100000 different countertop options (or what feels like) and I was lost. Not only the style and color but type of material and where to get it. I couldn't find what I wanted anywhere. I went back and forth too many times to count but after ogling around Restoration Hardware I fell in love with their vanity countertops. Luckily when I asked someone in the store they informed me they were Caesarstone. If Caesarstone is in Restoration Hardware you know it's legit! I immediately went on a hunt to find them! My top two choices were Calacatta Nuvo and Frosty Carrina. Frosty Carrina has slightly smaller veins so I went with that option and I was oooh soooo happy to have finally selected the Frosty Carrina Quartz by Caesarstone. Final answer. Plus they are super durable and can stand the heat of my curling and flat iron! *Side bar. How awesome is this black crocodile option! What a great backsplash that would be! I hope you enjoy my before and afters as much as I do! I love love love my new bathroom and couldn't be happier with my selection! I just wish I could redo the entire thing and have a giant Caesarstone slab behind my shower! Now that would be a showstopper! But I'm just so obsessed with the light, white, and bright bathroom. I feel so much better waking up and walking into my bathroom in the morning! What comes to mind when I say fireplace? Picture your fireplace; what do you see? Is it something that excites you? Is it something that you’re proud of or is it something that is just a part of your home? 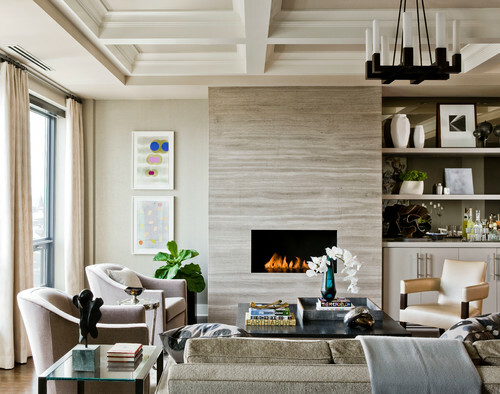 Fireplaces have gone from zero to hero in the home. They center the home and the family. 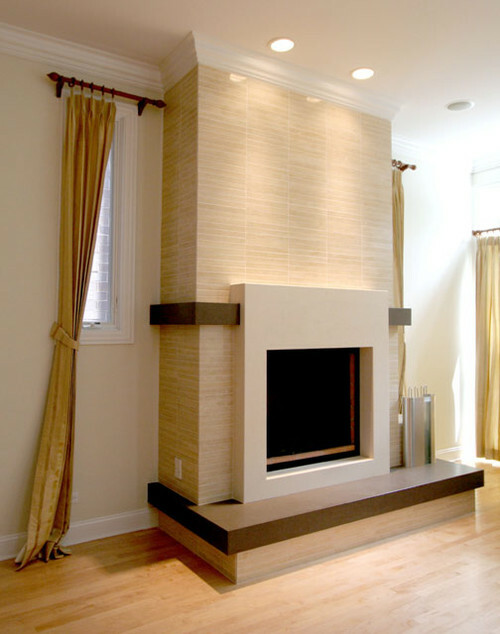 Your fireplace serves a multitude of purposes. Whether you’re conversing around your fireplace with friends and family sharing stories, warming up on a cold night, hanging stockings and decorating them for the holidays, or just taking pictures with the ones you love; Your fireplace is the main focal point in so much that you do in your home. Fireplaces have changed to anything but basic these days. 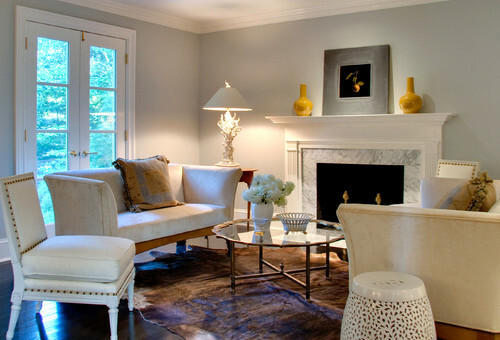 It’s time to vamp up those standard fireplaces. If you really want to increase the wow factor of your home without taking on a large project, renovating and upgrading your existing fireplace is definitely the way to go! The sky's the limit. My go-to and recommendation is Caesarstone. 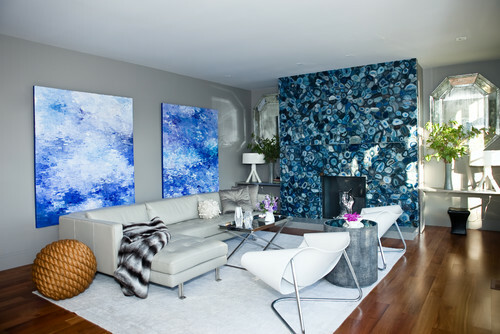 A giant slab of floor to ceiling Caesarstone makes a huge statement. Below are my absolute favorite fireplaces for creating that wow factor as soon as someone walks in your home. The above fireplaces are drop dead gorgeous. My next fireplace will most definitely be the black crocodile Caesarstone! Which one is your favorite?